Today’s Thrifty Goodness, originally uploaded by Temeculamom. Just found a new thrift shop today, and got this cute little collection for $2.85. 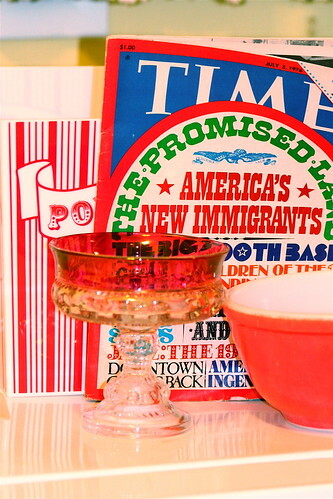 This is a red Pyrex bowl, a pink and clear cut glass goblet, a big, big popcorn box for watching American Idol with the kids, and a Time magazine from July 5, 1976. I remember that July 4th so well. It was the first time I was ever in a parade. Really we were just spectators, but someone thought we were cute and my sisters and mom and I got to ride on a float. Boy, did that make my decade! ~ by bekaboo on February 23, 2007. Great photo composition. I love how it all color cordinates and that you have a story to match the magazine. Scrapbook page coming up?